The Legend story of Mount Bromo is what we will discuss in this article. Mount Bromo is one of the active volcanoes in Java that is recognized for its beauty. People come for enjoying the sunrise on top of the mountain or admiring the massive Tengger Caldera surrounded by a sea of fine volcanic sand. But there is a legend behind it that you may want to know. Legend has it that the princess from Majapahit, who was a daughter of King Brawijaya, named Roro Anteng and her husband Joko Seger fled to Bromo region to get to safety from Madurese Muslim forces in the 15th century. Then they named the area “Tengger” from a partial combination of their last names. The kingdom under their rule was prosperous, but they couldn’t have any child. They prayed to the gods of Mount Bromo for children. One day, the god Hyang Widi Wasa answered they prayer and granted their request. They would be having children under one condition: they have to sacrifice their last born and throw him to the crater of Mount Bromo. They were blessed with 25 children. When the last children was born, Prince Kesuma, Roro Anteng and Joko Seger refused to fulfill the couples promise to the god. 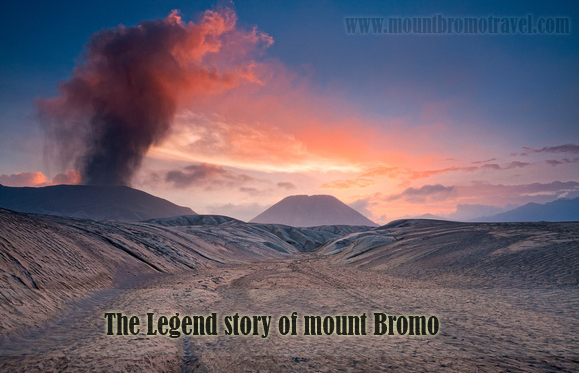 In the rage and fury of the god, Mount Bromo erupted and dragged Kesuma into the crater. Kesuma’s brothers and sisters held an offering ceremony to please the gods of Mount Bromo. The ceremony has been held annually ever since. The Tengger people, the descendants of Roro Anteng and Joko Seger still keep the legend alive to this day. Tengger people hold the ceremony every year, which is called Kasodo, to please the gods of Mount Bromo. The Kasodo ceremony is held every full moon of the 12th month of the Tengger Calendar. On the ceremony, Tengger people bring offerings to please the gods. They offer fruits and small animals in flower decorated containers. At midnight, they gather on the temple of Pura Luhur Poten. Then on the 14th day of the ceremony, they walk around the edge of Mount Bromo and travel up the mountain with their offerings to throw to the crater. Mount Bromo is a wonderful and magical place. If you wish to witness its Kasodo ceremony, please consult the local tourism centers for schedules and information whether tourists are allowed to spectate the ceremony that year. For a one of a kind traveling site, Bromo is the right choice for you to enjoy the scenery, the fresh air, interact with the locals and get to know a new culture, or experience the legend story of Mount Bromo.